that link will show you if your targeted. Not replicating on my Android (paid student prime). It has to be in app? seems the only way to play with the one click settings would be with the app, but once the one click settings are on then you can control it on your desktop. I think he meant to change to chase after getting the offer. 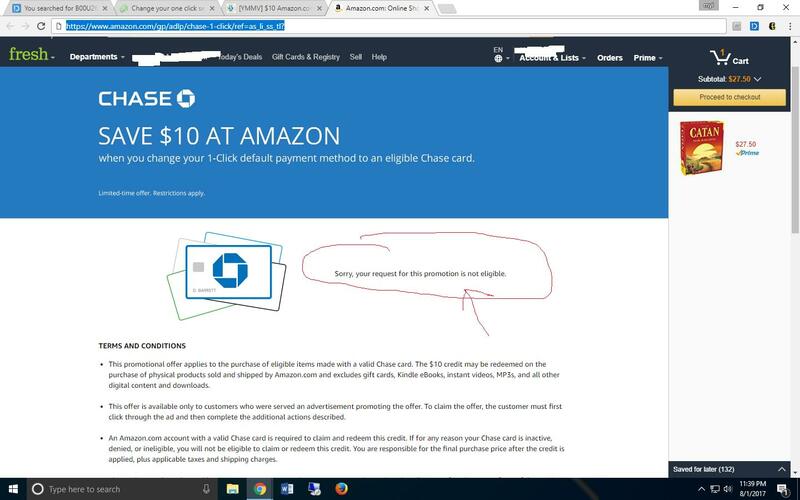 Yes understood that, just to actually get the $10 you would need to put chase as your one click. to be more exact on what to do heres the link. OP please post link next time. please update the original post with the link to this offer and it will show you right away if your targeted. I think op meant that you can get targeted via the method posted above. Will try again.. going in circles. That link will say you're not targeted even though sometimes you are eligible. Following the instructions in the OP should work for most people. just tried in my account, tried to put the one click settings on and off with a chase card as the selected card and refreshed 10-15 times, then exited the app and tried again no luck, then went to another account and signed in and was targeted with out doing anything, with a message on the front screen. I tried the link and wasn't targeted. I then followed the instructions, turned off 1 click setting, signed into app, refreshed home page a bunch of times and then got the offer.